Florida guard Scottie Wilbekin (5) shoots against UCLA forward Travis Wear (24) during the second half in a regional semifinal game at the NCAA college basketball tournament, Thursday, March 27, 2014, in Memphis, Tenn. Florida won 79-68. The Florida Gators are back where their last three seasons have ended with yet another chance to go to the Final Four. Michael Frazier II hit five 3-pointers and finished with 19 points as the Gators beat UCLA 79-68 Thursday night to reach its fourth consecutive NCAA regional final. "From a team aspect, I think we've done a great job of just staying in the moment and just trying to chase greatness," Frazier said. "When you do that, complacency isn't a factor so I think we've done a great job all year of just staying in the moment and chasing greatness." The tournament's overall top seed will play 11th-seeded Dayton on Saturday night for a trip to the Final Four. Dayton beat Stanford 82-72 earlier Thursday night. 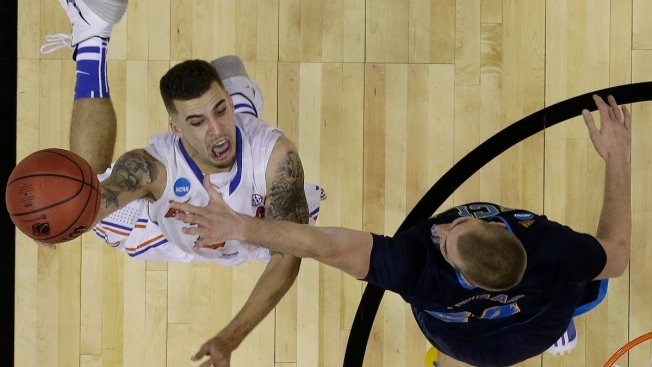 "Right now we got to put this game behind us and get focused on Dayton," Florida senior Scottie Wilbekin said. "They're a great team. Everybody is at this point in the season, and so we got to be locked in and ready because it's going to be a battle." The Gators lost to Michigan a year ago in a regional final. "But it's a new team that we have, and we're playing a new team so it's a totally different situation," Wilbekin said. "We're just excited to get this win and move onto the next game. We're totally focused on that. The past has no impact." UCLA (28-9) was back in a regional semifinal for the first time since 2008 under first-year coach Steve Alford. But the Bruins just couldn't match Florida's physical defense or outshoot the Gators. UCLA now is 0-4 against Florida coach Billy Donovan all-time — all in the NCAA tournament. Florida shot 50 percent for the game (29 of 58), including 59.3 percent in the second half. UCLA finished 42.2 percent (27 of 64) shooting in only their fifth game scoring under 70 points this season. The Bruins were a cold 1 of 12 beyond the arc in the second half. When the Bruins pulled within 56-55 on a layup by Norman Powell midway through the half, Finney-Smith hit a jumper for the first of 10 straight points. The Gators had UCLA running up and down the court so much Adams couldn't even hit the rim with a jumper despite having an open look at the basket. Wilbekin finished off the run with a three-point play that had the Gators solidly in control, up 66-55 with 5:34 left. "He hit two big shots down the stretch," Anderson said. "That's what you expect out of your senior point guard. He's been here in the Sweet 16 four years. He made big shots. Credit to him." For all the talk of Florida's stingy defense, UCLA opened the game blocking the Gators' first two shots. The Bruins only blocked two more shots the rest of the game. The Bruins came in as one of the nation's best scoring teams, averaging 81.5 points a game. Florida showed early it could shoot too, hitting 5 of 8 beyond the arc in spurt that turned a 14-11 deficit into a 20-16 lead. Back-to-back 3s from Frazier put the Gators ahead to stay.